Today is the 5th of May. You could have been celebrating Children's Day, if you were in Japan, or Cinco de Mayo, if you were in Mexico. There may be others who celebrate a holiday today, but for us here in Hawaii, those are the two celebrations that garner the most attention. Since I am of Japanese ancestry, the first holds the most meaning for me. However, instead of referring to today as Childrens' Day, most of us here in Hawaii still refer to May 5th as Boys' Day or Otoko no Hi (男の日), which is in turn part of the larger Boys' Festival or Tango no Sekku (端午の節句). When I was younger, Boys' Day meant putting up a display in my parent's house complete with dolls covered in armor, letting the koi streamers hang from a bamboo pole out front and eating kashiwa mochi or chimaki. Nowadays, it means celebrating by giving away some chi chi dango from Nisshodo to friends and co-workers. There is quite a large Japanese population here in Hawaii, and many of us order mochi for Boys' Day. I placed my order for the chi chi dango from Nisshodo about 3 weeks ago for pick up today. If I had placed my order any later, it may have been refused due to demand. By the way, if you're not too familiar with the area, Nisshodo is located in a bank of warehouses. If you're not too careful, you won't be able to find it. The sign is not visible from the street. You need to turn into the driveway and drive towards the back. You'll see Nisshodo on the left. Here's the shop at 6:00 am. Looks quiet right? To tell you the truth, I'm sure they've been up for quite some time preparing all the mochi that's going to be picked up today. When I approached the door, I saw a small sign on the door that said "SOLD OUT". For those of you who were hoping to get some mochi today, my apologies. Stepping inside the shop, which is located in a largely industrial part of Kalihi, it's empty. A few beer boxes sit behind the counter full of pre-packed mochi that's been ordered weeks in advance for today's festivities. 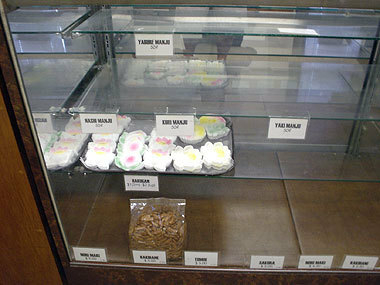 In the display case, you will find that very few of the items for sale are actually "displayed" here. For the most part it's empty, and I think it's main purpose is not to show what's offered, but to separate the work area from the customer waiting area. Besides, I think most of their customers are regulars. About a minute after my arrival, a worker appears from the door behind the counter. I explain that I'm there to pick the chi chi dango that I pre-ordered. She disappears through the door, only to appear a couple of minutes later with my order in hand. 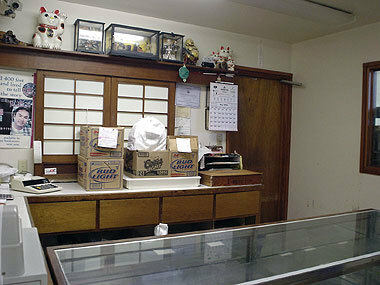 I normally order several pounds of chi chi dango (US$4.75 per pound) yearly. 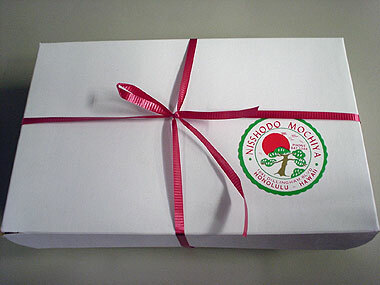 Each box contains a pound of chi chi dango and comes tied with a simple red ribbon. 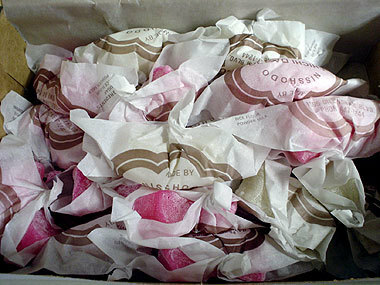 Inside each box are about 18 to 22 pieces of pink or white chi chi dango. They are individually wrapped, but not sealed, so they should be consumed on the day they are purchased. Besides, why would you want to wait to enjoy these? The chi chi dango is soft and sweet with a light dusting of katakuriko (potato starch). You can probably get mochi of similar quality at many other shops as well, but for me, visits to Nisshodo have become an annual tradition. For those of you who haven't had chi chi dango before, here is a recipe for microwaveable mochi that I use that produces a similar taste and texture. 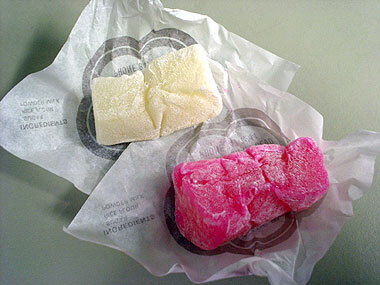 For the pink colored mochi, add a couple of drops of red food coloring to the mochi prior to cooking. - Water can be substituted with milk if preferred. - Kinako (roasted soybean flour) can be used instead of katakuriko depending on personal preference. Combine all ingredients in a bowl and mix until sugar and mochiko are dissolved. Pour the mixture into a 5-cup microwaveable tube pan that's been lightly coated in vegetable oil cooking spray such as Pam®. Microwave on high for 10 minutes. Remove from microwave and let mochi stand for about 5 minutes. Turn out onto a cutting board that's been dusted with katakuriko (or kinako, if you prefer). Cut into pieces with a plastic knife and serve. The mochi should be kept in an airtight container. Keep no longer than 3 days depending on the humidity. Mochi should not be refrigerated. 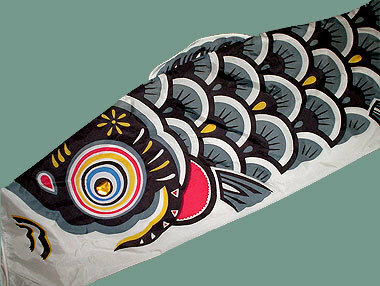 The koi no bori (鯉のぼり, carp windsock) didn't go outside this year, so I took his picture on the coffee table in the living room. Ah~ I didn't see any nice Koinobori this year. Didn't take any. Oh, how interesting! I've read about Boys' Day in Japan, but have never seen chi chi dango before. Thanks for the commentary. would you also give chi chi dango on Girl's day? growing up in a family with 2 daughter's we didn't celebrate Boy's day, but my grandmother did make 'inside out' mochi on March 3. You know, azuki beans on the outside and mochi on the inside, can't remember the proper name! Happy Male Day, Reid! I've had Nisshodo chi chi dango before (I recognize the wrappers), but never realized where it came from. ^_^ Happy Boy's Day! the sweets look so inviting. i love chewy sweets... now there's also mochi ice cream. i'm sure you've tried that. it's yummy. mochi reminds me alot of 'muah chee'. i believe you would have tried it when you were in s'pore. it's similar to mochi in terms of texture but i think it's made of rice flour (but not sure if it's the same one used to make mochi?) and coated with peanuts and sugar. is mochi rice flour easily available in supermarts? I so feel like making some of my own now... Mmmmm.. I've had daifuku Icecream, that stuff is AWESOME, icecream with the rice dumpling on the outside. 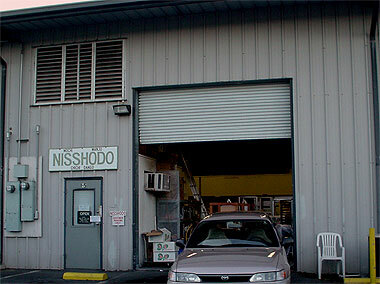 That aluminum door at Nisshoddo's sure brings back a lot of memories. We usually order a few boxes to take back as omiyagi for our friends and relatives every time we visit. Their chi chi dangos are so far the best as far as taste. There is another confectionery store near Nimitz which we also tried also but the quality wasn't as good. They had more flavor selections though like chocolate, grape, and other besides the plain mochi. One thing good about those chi chic dangos is that you can freeze and heat them up later in a microwave and voila...they're just as good...nice soft velvety taste. I've never been to the Nisshodo store, but I've definitely eaten their chichi dango, yum. I stopped by Fukuya on Boy's Day and, even without preordering, was luckily able to get a small tray of small daifuku (9 pcs - $4.50) and a small tray of mini yaki manju (10 pcs - $4.50) , each tray rubberbanded with a special bow tied on. oishii!! mmmm... This I have to try. I ran a Google on "Nisshodo Candy Store" and came up with all kinds of interesting stuff. Including the fact that there is a similar shop near here called "Shuei-Do". Seems the Emperor of Japan was a customer of this shop on his last visit here. I like mochi ice cream. We have a place here that make it with loads of yummy flavors. Here's the link to my post from a while back. Thank you. The chi chi dango was delicious. I think my koi no bori was sad because he didn't get to go outside this year. I don't have that book, but I'm going to look out for it. In my experience though, the microwave chi chi dango has been more "soft" than the ones I buy in the stores. Perhaps it's because they've been sitting for a while. BTW...I love kinako, it's much healthier for you too. I don't think I really celebrate Boys' Day, but it does give me an excuse to put up the koi no bori and bring mochi to the office. We would normally give mochi on Girls Day (or Hinamatsuri) as well, but it would be a different type of mochi. Girls Day as it's known in Hawaii is known as Dolls Festival in Japan. Yes, I've tried muah chee before, and while the texture may be similar, I think they are quite different. My Singaporean friends explained that the traditional muah chee is made with black sesame and rolled in ground peanuts. The mochiko (sweet rice flour) that I use is Blue Star brand and is available all over. If you'd like I can send you some. It about US$1.00 here. I think the place that you're thinking about is Fukuya. It's a little further down the road. I agree, their chi chi dango is not as good. Thanks for dropping by. I'm glad you were able to get some mochi from Fukuya. I don't really go anywhere else for mochi, except maybe to Kansai Yamato. I hope you get to try the mochi. Good luck and let me know how you like it. Thanks....you're right about Nisshodo. If you're not familiar with the location, it will be hard to find. I'll update the post shortly. I have been to Spots, but not in a very long time. I'll try to stop there soon. Aha... I've always been curious about how to make mochi. And this one is done in the microwave? Kewl. Ohhh, I checked it up and mochiko actually also known as glutinous rice flour. ya i have that here too. thanks much... can't wait to try out the recipe... i found a cocoa mochi recipe online... i'm gonna try it out... hope it turns out well! If you do try it, let me know. I sometimes use non-fat milk when making chi chi dango as it tastes "smoother". I'm glad you were able to find mochiko (glutinous rice flour). Good luck to you! I hope your chocolate mochi is a success. =) I'm very anxious to hear how it turns out. Aha... even better. I didn't realise mochiko was glutinous rice flour. Woohoo. Dead easy to source! yea, mochiko is the japanese term for sweet rice flour aka glutinous rice flour. ahhh i'm so disappointed. the cocoa mochi was a disaster. weird thing was, i followed the recipe accordingly and re-checked it again! but i could phantom how it failed. the recipe didn't make sense. then, i had some flour left so i decided to add the syrup to the flour first then microwave it. but alas, it failed. turned out like some dry brown substance. eeks. I do think that the next time i try to make mochi, it wouldn't be the microwave version. i hope my next attempt (maybe butter mochi) would be successful! PS. weirdly so, i got the cocoa mochi recipe from bluestar website! Well I guess you have no excuse for not trying this right? If you're going to make chi chi dango, use milk instead of water. I think it tastes better. I'm sorry your chocolate mochi turned into a disaster. The microwave recipe is not a bad one, though I just think that maybe the instructions for the recipe that you used weren't so clear. If you'd like, I can send you the chocolate mochi recipe that I normally use. You can try it out and let me know what you think. Otherwise, I'll be posting a recipe for butter mochi in the next couple of days...stay tuned. Seriously, Kansai Yamato opened in the Makai Market at Ala Moana. I'm going to have to stop by and get some mochi from them. The last time I was at Daiei, they had warabi mochi. Mmmm!